Team sports can be a great environment for kids to make friends, gain confidence and grow as young adults. 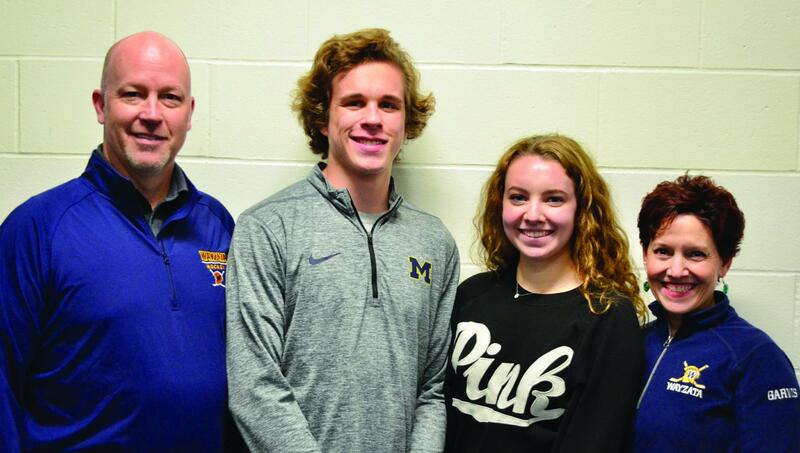 It can also provide a community of friendship and support – which has been perfectly exhibited this year in Wayzata where two players on the varsity boys’ and girls’ hockey teams helped each other out with a similar problem. Mike North and Steph Garvis have a lot in common. They love hockey, their team and their family, but they also share something they wish they did not – a parent with cancer. “I found out a couple days before Christmas,” Mike said. “In my family room, my parents brought me and my siblings over and told us." Mike’s father had rectal cancer, news which completely blindsided the Wayzata senior. Steph’s story is, understandably, one filled with fear. Like Mike, the news of her mother’s lymphoma was unnerving to say the least. However, she had some idea of what was coming. Steph had a tougher time. Seeing her mother go through treatment and sickness took a toll on her as it would for any child dealing with this situation. The feelings were so difficult for her to handle she even started having trouble in school. That is where her hockey community came in. Sports can be a great place to exercise the body, but it can also be of great help to the mind. Both Steph and Mike found solitude on the ice rink. It became a place where, for at least a few hours, they didn’t worry about their parents’ condition. It became a refuge from real life. They both confided in friends and school staff to help them through the tough time, but they also did something that so few of us do – try to turn a negative into a positive. When they had to do a senior project for National Honor Society, they decided to do something that would make them feel better and help others in similar situations. They organized a fundraising benefit in December when the teams hosted Hill-Murray called “Cancer Pucks.” They asked fans to participate in chuck-a-puck and to bring new hats and socks for cancer patients at Abbot-Northwestern. Proceeds from the event went to the Virginia Piper Cancer institute as well. Their motive for the event was surprisingly simple. “We wanted to make something good out of something that was bad that affects so many,” Mike said. They raised more than $3,600 in one afternoon and collected many socks and hats as well. What began as a school project turned into a passion project for these two seniors, that helped them with some healing as well. Both Mike’s father and Steph’s mom have now beaten cancer and only require annual check-ups. Steph and Mike will graduate in the spring and head off to college. The lasting effect is a profound appreciation and respect for their community and their parents who have endured so much. Lessons learned on the ice and in life, and it had nothing to do with the game at all.